As a child of the 80's, I grew up playing games like Asteroids and Space Invaders, so when I saw that Galak-Z was basically taking the best of both worlds, modernizing it, and offering it to the masses, I had to check it out. PAX has been a very indie experience for me this year, and full of retro goodness to boot. If you saw my Duck Tales: Remastered review, you probably know that I appreciate a modern take on the classics, so it's no wonder Galak-Z really spoke to me. 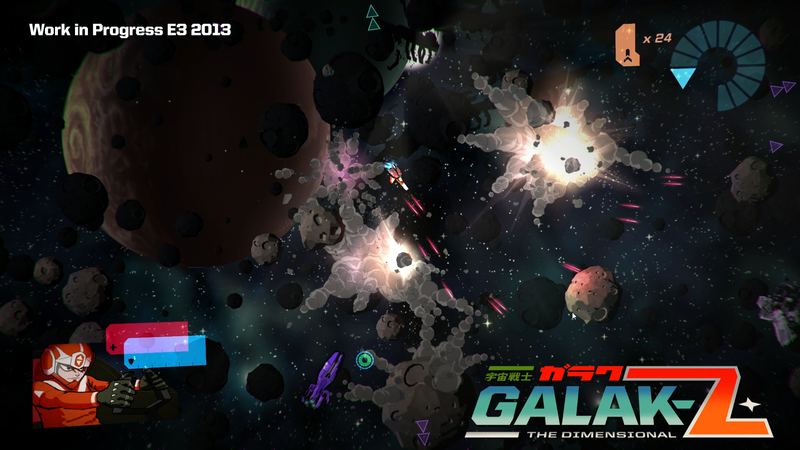 Galak-Z puts you in the pilot's chair of a small fighter in space. 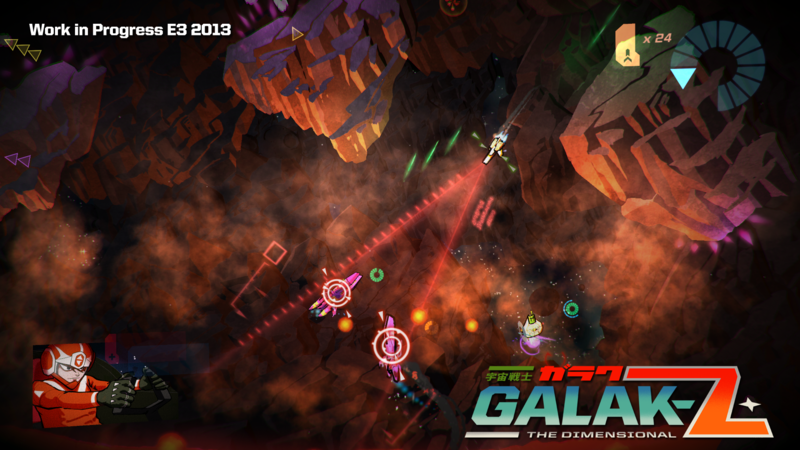 You'll defend yourself with lasers and missiles, while trying to keep yourself oriented while drifting in zero-G. The controls are simple, but mastering them is a serious challenge, since you'll need to master drifting in between boosts, and navigating with your standard thrusters. You're not moving too fast unless you're using your special Boost ability, and collisions didn't seem to damage your ship unless you ran into hazards, so it is a very forgiving game in that regard. The enemies, however, can be absolutely devastating unless you use sound tactics for taking them on, but we'll get to that later. 17-Bit, the studio behind Skulls of the Shogun had their fill of the strategy genre, and wanted to move into something more action oriented. Alongside a profound love of 70's and 80's anime, Galak-Z was born. Tired of "fighting the camera" in 3D action games, the team decided instead to focus their efforts on a 2D title, where the camera doesn't come into play. While I didn't get to see it, there's apparently even an open world side of the game, in the vein of Red Dead Redemption, where you can simply explore the galaxy and find dynamic events to take part in. 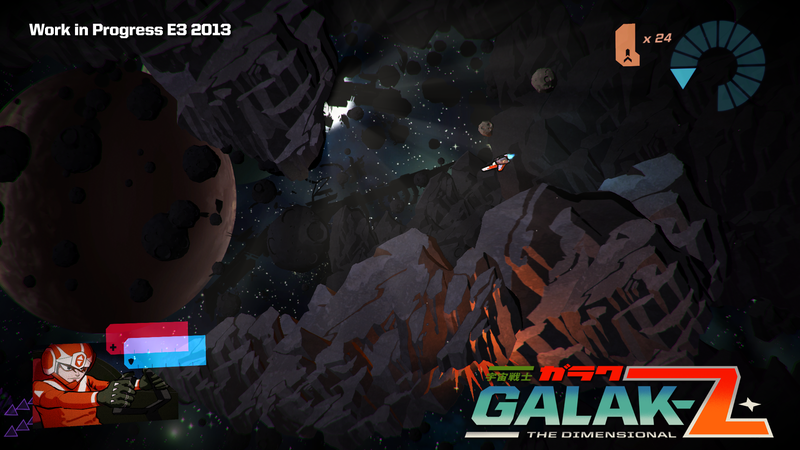 This isn't just an actiony space shooter, though. It's got a lengthy story to tell in a very anime style. The character portrait art reminded me a lot of Speed Racer or any number of older anime series. I didn't really get a sense of the story premise, but the characters introduced in the demo were likeable enough that I'm looking forward to seeing how they progress through the narrative. There are plans for multiplayer, but the 17-Bit crew was tight-lipped about that side of things, suggesting that, while they have big plans, nothing has been finalized as yet. It's possible that there will be cooperative multiplayer, as well as competitive, but until we get confirmation, I'll leave speculation alone. The enemies in Galak-Z ranged from small ships that served as basically target practice, to devastatingly powerful, sword-wielding robot mech-like creatures. You'll get a good sense of how to maneuver and fire from the basic enemies, and you'll test your more advanced tactics against the bigger ones. The demo's learning curve was incredibly sharp, but I'm told that it will be much more gentle in the final game. This game, like other retro-styled titles I've seen at PAX this year, won't necessarily be for everybody, but don't judge it by its cover. From the single player story mode to the multiplayer, it has a lot to offer the gaming space, especially for an indie title. 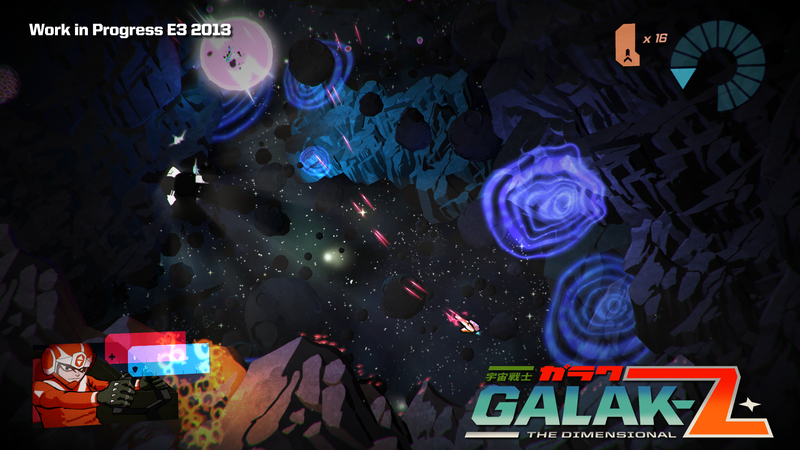 Galak-Z is aiming for a Summer 2014 release on PS4 and PC via Steam.